Ken Clark is a proud man. At age 72, he has made a living off his land, perched on a crest of the Catskill Mountains, in rural, upstate, Gilboa N.Y., for over 35 years. He said he’s never asked anyone for a hand out. Clark’s neighbors, in surrounding Schoharie, Delaware and Greene counties, are proud too. They are also, as was evident during today’s New York State Republican Primary, resolute in their party loyalty. While turnout for the all-but-over primary was low, Republican residents said come November, they’ll all be at the ballots, to make sure anyone but President Barack Obama is in the White House next year. “It’s a very Republican area, generation after generation,” said Gilboa Town Council member Dorothy Pickett, standing in the town hall parking lot before going in to vote. The lifelong Republican said none of her party’s candidates stood out to her this year, which is a shame, because the last thing she wants is another four years of Obama. Clark put that sentiment more strongly. On his steep plot, overlooking the Gilboa reservoir, which supplies one-twelfth of New York City’s water supply, Clark has, at one time or another, run a grocery, a hunting supply store, a hog farm and any number of other ventures. 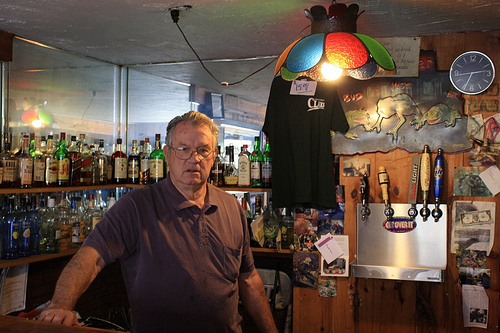 Currently, he runs an often-empty bar and restaurant off of Route 990V. It’s called Clark’s and he built it with his own hands. Clark is worried, bracing for the disaster that he believes may unfold if Republican front-runner Mitt Romney doesn’t defeat Obama. He’s not sure exactly what horrors a second Obama term could bring, but he said it wont be good. He fears the president will breed a deep financial depression, spread communism, or maybe even start a race war, which Clark believes has already begun, as minorities take over job markets white kids now feel too entitled to work in. Today, Clark said he would be voting for Romney in the primary because the former Massachusetts governor knows how to run a business. While Clark isn’t crazy about Romney, he doesn’t slight the candidate for his personal wealth, as others do. While upstate New York Republicans seem to accept Romney as their inevitable candidate, around the intersection of Greene, Delaware and Schoharie counties, none could be found with any strong feelings for the GOP’s hopeful. “I call him, ‘the pretty boy,’” said Ashland N.Y., Republican poll watcher, Joan Holdridge, referring to Romney. Nether of the sister-in-laws are confident Romney will win the presidency. Anderson said that in the end, both parties just say whatever it takes to get elected, then do whatever they want when they’re in power. After finding out tuesday night that it was the N.Y.S G.O.P primary. I was very angry that not much was said about it.My wife works in the high school of our town and nothing was said about it. could it be the work of the dem. party? Maybe. I know i will pay more attention to what is going on. I thought i knew what was going on politically. i try not to miss anything. i am a registered conservitave.Iknow the progressive left is destroying America! We cant and must not let them continue.So dont make the mistake i made! lets get on the ball and take our country back in Nov. I feel like I jst sat back and helped the progressive left ! ! !